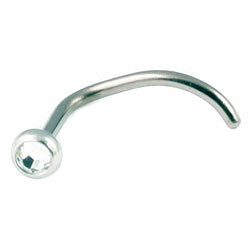 Hypoallergenic Blomdahl silver titanium nose/nostril studs inset with 3mm clear crystals. 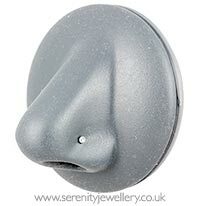 Silver titanium nose studs have a silver coloured coating on the visible parts only, this does not come into direct contact with your nose. It is only the skin friendly titanium that comes into contact with your skin. Prompt delivery & quality jewellery. Very neat & pretty! Thank you. "Blomdahl silver titanium crystal nose stud"
Absolutely LOVE my new nose stud! The tail stays tucked in my nose and is quite comfortable!